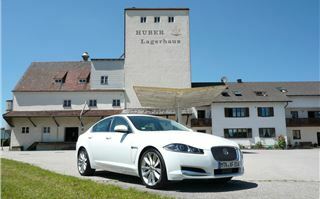 The new Jaguar XF 2.2D offers a tax-break XF to company drivers without losing too much XF DNA. It had to be done. 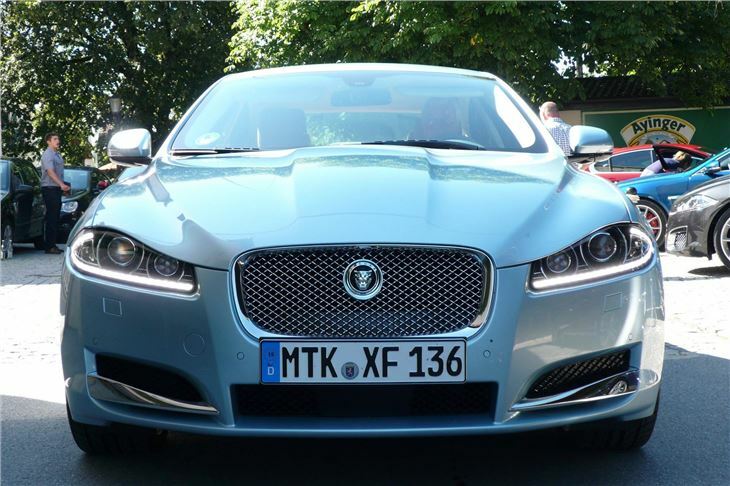 Jaguar was forced to put a 4-cylinder diesel engine into the XF for four reasons. Audi puts one into its A6, BMW puts one into its 5-Series. Mercedes puts several into its E-Class. And, this year, sales of 3.0 litre diesels have plummeted throughout Europe while sales of ‘executive’ level four cylinder diesels have risen by much more than 3.0 sales have dropped. It’s all about CO2 emissions in the EC’s much-maligned certification tests. If manufacturers don’t get their corporate average CO2 down below 130 grams a kilometre by 2013 then they are going to get fined. On top of that companies that buy or lease cars for their employees, and the employees who drive them, face increasing levels of company and Benefit in Kind tax for running high CO2 cars. 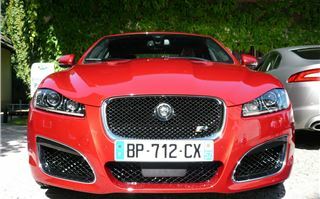 Before the XF 2.2D, an employer could not sensibly put an employee into an XF because companies suffer penalties on cars emitting more than 160g/km, and this limit is set to go down year on year. Similarly, employees face paying tax on the Benefit in Kind of their car based on a percentage of the car’s list price that increases according to the amount of CO2 it emits. The XF 2.2D 8-speed automatic emits just 149g/km CO2, same as a Mondeo diesel auto or a BMW F25 X3. 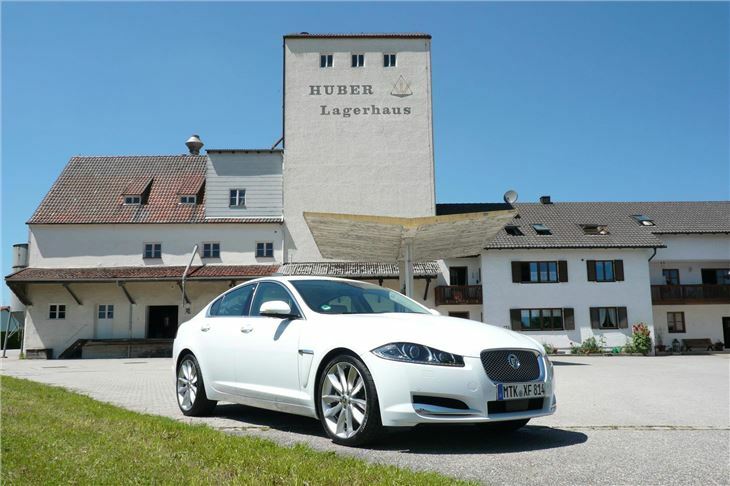 So, whereas most middle management couldn’t even look at having a Jaguar in the driveway, now they can. But would they want to? 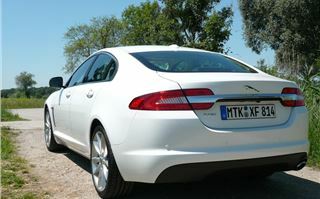 Is the car a colossal disappointment compared with all we’ve come to know and love of the XF 3.0 litre diesel and XFR? It’s about as refined as you can reasonably expect a 4-cylinder diesel ever to be. It’s decently equipped in £30,950 standard SE trim. Gets satnav in £33,950 Luxury trim. And gets all sorts of luxuries, including a suede-like headlining, in the top level £43,050 Portfolio trim we were driving. It lacks the 3.0 litre diesel’s ‘Dynamic’ drive mode. But has a ‘Sport’ transmission setting. And you can paddle your way through the gears to your heart’s content in either standard ‘Drive’ or ‘Sport.’ Though in Sport you get a large digital numeral in the centre of the dash telling you what gear you’re in. You can slop along in drive without touching the paddles and enjoy Jaguar levels of refinement. But if you want to hustle a bit you can hear four cylinder diesel noises coming through and the box needs to change gear quite a lot. So better, then, to paddle it along and select the gears yourself. The lighter front end brings more understeer than I’m used to in an XF, despite the test car’s 20” wheels. (No worries about the wheels and tyres on this occasion because we were driving on billiard table smooth and completely pothole free Southern German roads.) And you can’t always bring the back end round as you can on the bigger engined cars because there isn’t always enough power. So while it’s still an enjoyable drive, and probably beats an A6 or an F10 520D or a Mercedes E250CDI, it’s nothing like as seductive as the 3.0 litre diesel. And the truth of it was, on my drives, the XF2.2D was having to work so hard it swallowed a hefty 9.8 litres per 100 kilometres of diesel compared to the 7.5 litres per 100 kilometres of the more relaxed 3.0 litre diesel. That said, Jaguar did have a man drive the 2.2 diesel 816 miles from Castle Bromwich to Munich on a single tank of fuel at an average of 57mpg. 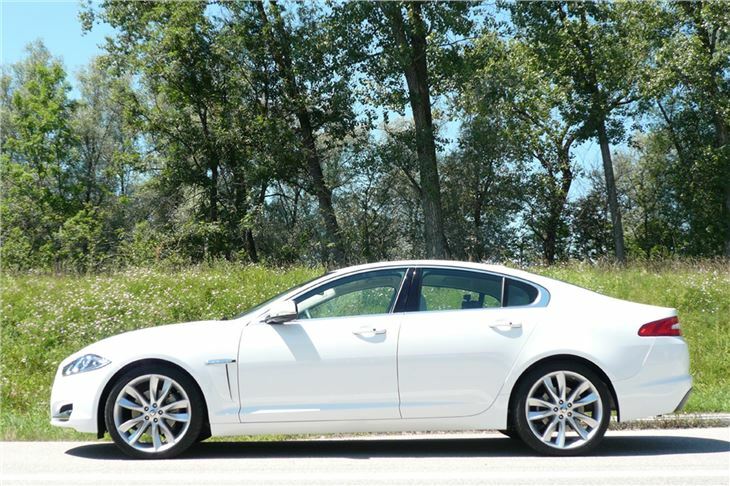 So if you’re middle management and you’ve always wanted a company Jag, go for the XF 2.2 by all means. But if you’re a private buyer, spending your own precious money, far better a mid spec XF 3.0d than a high spec XF 2.2d for the same sort of price. 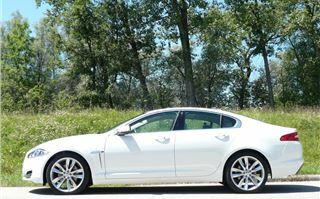 All XFs are comprehensively restyled for the 2012 model year (that starts now, in the same way as American car model years). 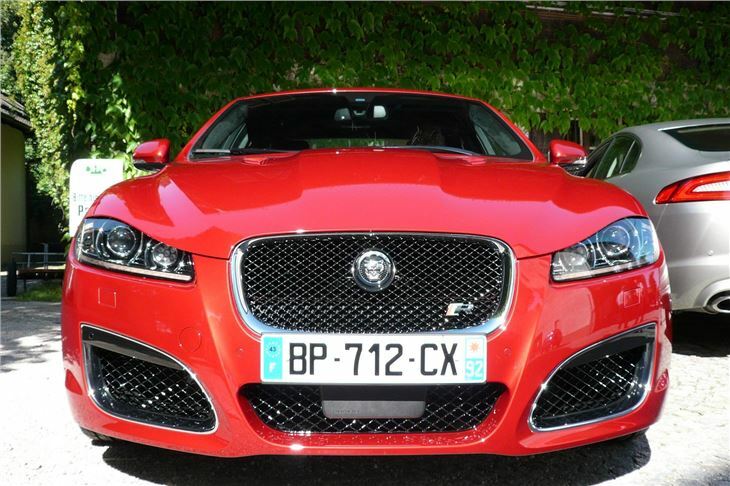 Ian Callum’s team has tastefully enlarged the grille, made the headiights more eye-shaped using the latest technology, incorporated ‘J-blade’ LED daytime running lights and enlarged the front side grilles of the XFR to make it more of a rear mirror monster. Inside, new, more comfortable seats, black instead of chrome switchgear, better satnav and colour turn-by -urn instructions right in front of the driver enhance the driving experience. The XFR remains a wonderful, fire-breathing dragon of a car, emitting King Kong like noises whenever you stomp on the loud pedal (to mix my metaphors). Yet, though the XFR is still capable of 29mpg, the XF to spend your own money on remains the 275PS 3-litre diesel (that now shares the 8 speed ZF automatic box of the XF 2.2) and continues to be one of the most rewarding cars you can buy to drive every day. 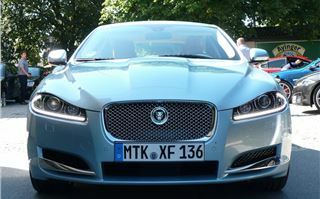 Footnote: Graeme Roberts of just-auto.com has reminded me of something I missed on my test of the Jaguar XF 2.2 diesel, and indeed all 2012 MY Jaguar XFs. The 'J blade' LED Daytime Running Lights incorporated into the headlight lenses automatically dim when the indicators are being used. Can't say if this is a 'first'. But it certainly overcomes criticism that DRLs can mask turn indicators and cause crashes that would not otherwise have happened.